Tom Zé’s debut album is a good one, but it can’t really hold a candle to his later stuff in my mind. I hear bits of ornate chamber pop of the kind Andrew Loog Oldham made with The Rolling Stones (Metamorphosis), a satirical take on commercial culture like The Who‘s The Who Sell Out, protest folk like Bob Dylan, bossa nova, Brazilian folk of many stripes, and avant-garde classical/jazz. I love all those bits and pieces, and the idea of throwing them all together. Yet this sounds a bit too precious. The record is also recorded rather poorly, with Zé’s vocals off in the distance and flat dynamics that crunch most of the instruments together, except for the organ. Admittedly, I might be unfairly critical because this music relies heavily on lyrics and I don’t speak Portuguese. 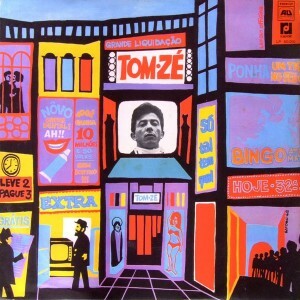 So, anyway, a promising start, but dig deeper into the man’s catalog for bigger rewards, or at least stick a toe into deeper waters with Brazil Classics 4: The Best of Tom Zé – Massive Hits.